What is Oculus Santa Cruz and how will it change VR? The future of virtual reality could have just been revealed at the Oculus Connect 3 keynote event. The Facebook owned Oculus saw its overlord Mark Zuckerberg take to the stage to announce the new wire-free VR headset that is Oculus Santa Cruz. According to Zuckerberg there is still a sweet spot between wired headsets like the Oculus Rift and smartphone driven headsets like the Samsung Gear VR. This, he claims, is where the Oculus Santa Cruz sits. So what can we expect from this future-gazing headset which is still in the prototype stage right now? The Oculus Santa Cruz, unlike the current Rift, is not restricted by wires. That means you'll be able to look around freely, and even walk about, without the worry of getting snagged. On the downside here the problems presented by going cable-free include carrying a power source around on your head and being limited to the processing grunt of whatever is crammed into the headset. So while the current Oculus Rift can hook-up to a PC for more processing power and the Samsung Gear VR is limited by the smartphone running it, this Santa Cruz should find a happy medium. One of the limitations of stand-alone headsets like the Samsung Gear VR is that they can't allow for movements around the real world that is mimicked in the virtual one - outside of head movements of course. So where sensors placed in a room can work with an Oculus Rift to let you walk about the real and virtual rooms, the Gear VR can't match that. This is where the Oculus Santa Cruz aims to hit that sweet-spot. It will use “inside-out tracking” in order to allow the headset to track positional movements. This is done using four small cameras that are built into the front of the headset and are capable of building a picture of the position of the wearer. In a demo room experience the headset appeared to be able to detect the room boundaries to display them virtually as blue lines in the VR world. No walking into walls there then. This is similar to what the HTC Vive does, only minus room placed sensors and wires attached to the headset. This could allow for far more immersive gaming, virtual touring and exploratory features currently limited to a room setup for VR. The entire Santa Cruz headset has all its computer power and battery within the headset. This is something that can be tough when placed on a head. The headset features cameras in the front as well as the screens. But it appears that the computing grunt and perhaps batteries are placed in a unit on the rear which its on the back of the head. A clever way to make the experience more comfortable without compromising on power and longevity. Realistically the Santa Cruz headset is a prototype that's still a long way from production and sale. 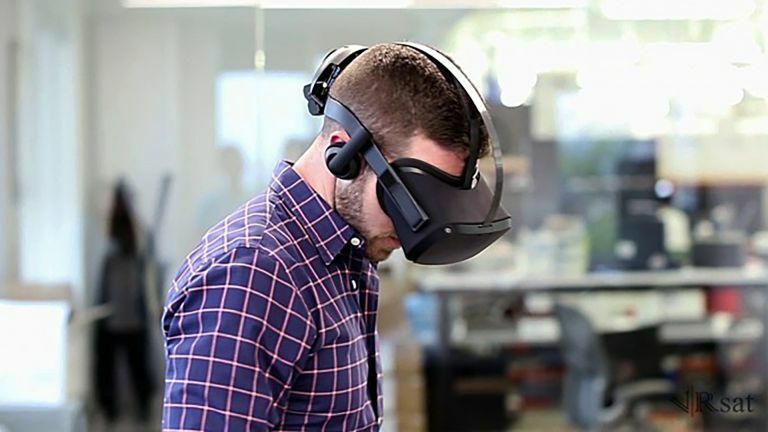 It's possible that Oculus will simply use this headset as a test bed for the “inside-out tracking” tech which it could integrate into future Rift or even Gear VR headsets. The one thing that's clear is that the virtual reality future is going to be wire free, will track movements and will ultimately be more immersive than ever before.